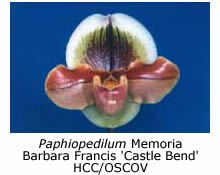 All of these genera have the characteristic ‘pouch’ or ‘ladies slipper’ and a column structure that differs from that of all other orchids. Generally, only two of the above genera are commonly cultivated in Victoria. They are the Phragmipedium, which we see fairly frequently, and of course the Paphiopedilum. 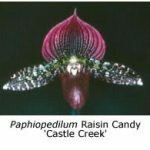 The first paphiopedilum (or cypripedium, as they were then known) introduced into English glasshouses (in 1819) was Paphiopedilum venustum. 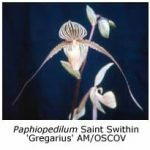 Many new species were introduced to cultivation in the famous plant-hunting times later in the 1800s and the first hybrid, Paphiopedilum Harrisianum, was introduced in 1869. 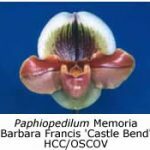 Many, many thousands of hybrids have been made since then and it is possible to have tremendous floral diversity in a collection of paphiopedilums, with flowers throughout the whole year. Each group has slightly different cultural requirements and some of these will be discussed at the conclusion of this article. Culture: An observant grower might well say that it is the total set of cultural conditions that needs to be reproduced, rather than a number of individual components such as growing medium, water, light etc. 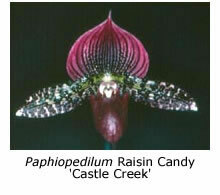 When growing paphiopedilums, it is most important to grow a good root system. To the unconverted this may seem logical, but I have seen (and would be lying if I did not admit to having) plants that grow splendidly and flower well, yet have no roots. These same plants, when flowered subsequently with a good root system, have excelled, the difference in flower quality being almost unbelievable. The moral of the story is to grow good roots on your paphiopedilums. Potting Medium: Being terrestrial in nature and having no pseudobulbs to store water, paphiopedilums require a growing medium that retains some moisture but does not keep the plant wet. I have found that relatively fine, composted or weathered bark (3-5 mm size) provides an ideal base for a paphiopedilum mix. Indeed, if the plants were to be repotted every year, this might provide an ideal medium by itself. But few of us have time (or make time) to do this and so I add about 30% granulated polystyrene to the bark. The polystyrene keeps the bark from compacting, particularly as the bark begins to break down. Polystyrene is sometimes difficult to mix through the bark, but I find the task a little easier if the polystyrene and the bark are of similar particle size and the components are thoroughly moistened. To each cubic metre of mix (equivalent to 1000 5-in pots) I incorporate 2 Kg Hoof-and-Horn, 400 g iron oxide (GU 49) and approximately 4 Kg Dolomite lime to bring the pH of the mixture to 5.5 (the amount of Dolomite required varies with the type of bark). I use no drainage material in the bottom of the pot when potting and firm the mixture down with gentle thumb pressure – not too tightly. A small amount of slow-release fertiliser is then added to each pot. Fertiliser: All plants in my collection are fed with any of the commonly available liquid fertilisers (Aquasol, Maxicrop etc.). The balanced types are used more frequently and those rich in a particular element, such as nitrogen, less frequently. All are used at about one-eighth the recommended strength every second or third watering. By linking feeding and watering, we link it with the rate of growth. That is, when the plants are growing strongly (in summer and autumn), we water more and hence feed more. No doubt there are many more complex and well-reasoned feeding programs available but in my opinion fertilising is a greatly overrated subject in orchid growing. Greater improvements in culture are likely to be gained by concentrating on light, temperature and watering. Water and Humidity: With the type of potting mix that I use, a thorough weekly watering is sufficient in mild times of the year. Between watering, however, every effort is made to keep the plant-house as humid as possible. In very hot weather the frequency of watering is naturally increased, and of course in winter the frequency of watering is decreased. It is most important when watering that the pot is thoroughly drenched and that fresh water reaches all parts of the pot. Watering not only provides the plant with water, it also forces all stale air from the pot, replacing it with fresh air. Watering is one of the most important aspects in producing a good root system. 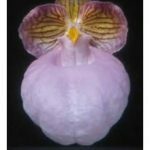 Temperature: There are a few paphiopedilum species and their immediate hybrids that will tolerate conditions similar to those suitable for cymbidiums. They include Paphiopedilum insigne, P. spicerianum, P. hirsutissimum and P. venustum. Some single-flowered species such as P. charlesworthii and P. sukhakulii also tolerate these conditions but in my experience they rarely excel. If you are growing paphiopedilums cool, I suggest using a coarser grade of bark and keeping the plants a little drier in winter. All of my plant-houses are heated to a minimum of 12 o C and the breeding plants are maintained at a minimum of 16 o C. At the higher temperature I find that my plants are more likely to produce two new growths instead of one, to grow larger leaves and (if watering is correctly managed) to grow better roots. At the higher minimum temperature it is important that the humidity remains high, although I allow the humidity to fall a little when the new growths appear and commence growth in the period February to April. This reduces fungal attack, which can be a problem at this time. Light: There are two aspects that we need to mention – duration and intensity. It is most desirable to have light on the plant-house for as long as possible each day. Houses that are in shade for half the day will never produce as good a result as those in sunlight all day. 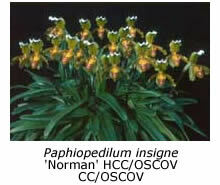 A common fallacy is that paphiopedilums do not require bright light. I have found that plants grown in too much shade produce short flower stems and fewer new growths. Each year I apply three thin coats of whitewash to my plant-houses, and by Melbourne Cup day I have applied whitewash equivalent to 50% shade. In addition the houses are lined with Marix cloth, which produces an even, diffused light. Under these conditions the plants develop shiny, dark green leaves and look healthy. Potting: I use plastic pots exclusively. If a plant is to be exhibited at its best, it should be flowered on a large plant with two or three mature growths. The flowers from these mature plants are vastly superior to those from small, single-growth plants. This can be particularly true of seedlings, so take care not to discard a seedling that is flowering on a small plant. Seedlings and small plants seem to benefit from frequent handling. I try to pot them yearly, although not necessarily into a larger pot. Larger pots are repotted every second year and occasionally every third year. Each time I handle one of these I wish I had repotted it the previous year! Generally I can divide a plant every second potting (that is, every four years). Some vigorous plants can be divided more often. I keep the divisions as large as possible and thoroughly remove old roots, leaves, mix etc. Keep in mind that it is likely to be two years before we can repeat the task. Good housekeeping throughout the year, keeping the house tidy and removing dead or dying leaves is also important. 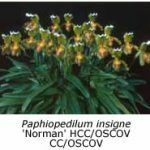 Special Groups: Multi-flowering paphiopedilums, such as P. philippinense and P. chamberlainianum, that regularly produce more than one flower to a stem, prefer higher temperatures and slightly higher light levels than other types. I often hang their pots during winter so that they receive more light and warmth. 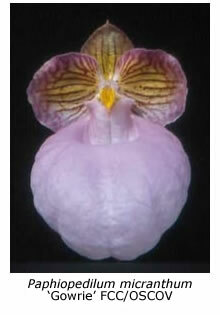 Maudiae-types also tolerate higher temperatures and grow more prolifically at higher temperatures. This group includes the alba or green-flowered type, the coloratum or maroon-coloured forms and the vini-coloured or black forms, which are popular at present.